depressive symptoms or depressive episodes. 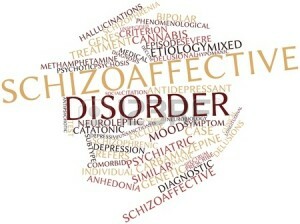 The most effective treatment for schizoaffective disorder is a combination of drug treatment and psychosocial interventions. The medications include antipsychotics along with antidepressants or mood stabilizers. The newer atypical antipsychotics such as clozapine, risperidone, olanzapine, quetiapine, ziprasidone, and aripiprazole are safer than the older typical or conventional antipsychotics such as haloperidol and fluphenazine in terms of parkinsonism and tardive dyskinesia. The newer drugs may also have better effects on mood symptoms. Nonetheless, these medications do have some side effects, especially at higher doses. The side effects may include excessive sleepiness, weight gain, and sometimes diabetes. Different antipsychotic drugs have somewhat different side effect profiles. Changing from one antipsychotic to another one may help if a person with schizoaffective disorder does not respond well or develops distressing side effects with the first medication. The same principle applies to the use of antidepressants or mood stabilizers.